Have you dreamed of owning your own raised beds for growing your vegetables? Shied away because you are tool challenged or just don’t have the know how? Or when would you find the time? Back to the story. Last year, I grew vegetables in 10 raised beds and 11 in the ground. My tomatoes did not do as well in the bare earth compared to my raised beds. So, the light bulb went off in my head last year to make more raised beds. I surfed the web and found that buying eleven raised beds could be very expensive. I’m Hooked. 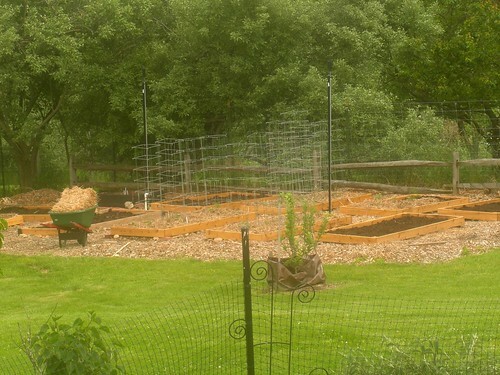 I want Raised Beds. Yeah, I knew I would convince you on going the Raised Bed route. It is the primo way to go. so, you gotta have them. I know. I feel your pain. So, here are three ways to buy or make raised beds. It is all depending upon your wallet, time availability, and tool acumen. Simply buy them. Can’t get any less tool challenged then that. Check out my favorites at Gardener’s Supply. In fact, you might just love the Gardner’s Supply’s cedar raised bed pictured above. (Note, I am affiliate…perhaps a groupie since I absolutely adore this Company.) Gardener’s Supply has lot of choices so that you can choose all different sized garden beds. Personally I hate choices since I agonize over which one to choose . Should I get the taller one which is good for carrots and parsnips? Maybe I don’t want to bend as much? Or perhaps I don’t have as much room so I might opt for the 3 by 3 bed. Before you know it, an hour has flown by. FYI, I have a few 3 by 3s which are 10 inches high as well as cedar 5 inch raised beds. I think I am handy but sadly I am not. Watching me screw or hammer something is painful since all my screws and nails kind of go into sideways. My first attempt at making raised beds was to have someone cut my 4 by 8 board in half to make the two sides (north and south) and used two other 4 by 8 boards for other sides. To connect everything in place, I bought raised bed corners. They made putting the bed together quite easy. However, when you start adding the cost of the boards and the raised bed corners, it can get expensive. Not as expensive as buying completed raised beds, but expensive when you need 11 beds. Just to give you a frame of reference. I buy knotty cedar decking which cost me $1.79 a foot. The lumber for an 8 by 4 bed cost about $43 (without tax). The raised bed corners cost $16.95 for 2. Total about $76. Still less than buy a completed raised bed. 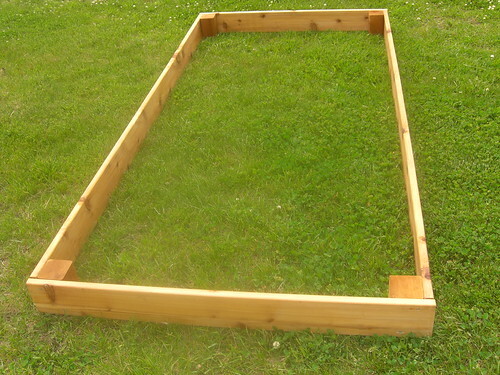 If you are handy, you can easily make your own raised bed. Heck, you can cut your own boards yourself. I always ask the lumberyard to cut my boards and they usually oblige. However, this time, they charged me a small fee to cut my boards since I asked them to cut posts to make corner blocks so that I could screw the boards into to them. In addition, I purchased steel screws so they did not rust. The hardware store told me which size to purchase. Here is what I did now that I had all of my supplies. I adapted the raised bed instructions in Sunset’s the Perfect Raised Bed article to my situation. Great pictures on this site for more information on how to construct a taller raised bed. 1. Seals the Board. You don’t have to seal Cedar but I like to seal the boards to protect them. I used an environmentally friendly product called Weather Bos which penetrates the boards. I love this product and have been using it for over seven years on different applications. See the picture below as to what the product looks like. Easy. Easy to apply. Using my earth-friendly paint brush, of course. Soap and water clean up. 2. Pre-drill the holes to make it easier to screw. 3. Nail one side of the board into the corner block (see picture above) which is a 4 by 4 post cut into blocks the height of the boards. In my case, the blocks are 5 inches tall. If you want to use an inexpensive straight edge to make sure your corners are square, I was told to use a piece of cardboard. 4. Repeat on all sides. 5. If you want to check if the raised bed is square, simple measure diagonally from one end to the other and then the other side forming an “X.” Both lengths should be the same. To be honest, my husband just screwed everything and called it a day. He did not care if they were square or not since they would be filled with dirt. Cost? 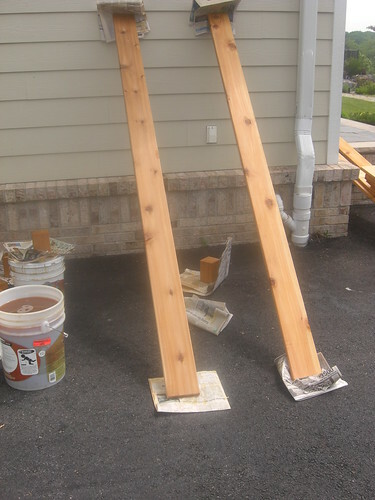 Cedar Boards, cutting charges, screws, and corner post. Each bed cost me about $50. You could do better by finding a less expensive lumberyard. I went to my local yard since I knew they would take pity on me and cut my wood for me. They charged me about $11 to cut the boards and posts. Pictured above is the finished product. It took a long time because the drilling is not easy. But again, we are kind of tool challenged. Have you made your own? Would you try making your own? I built raised beds in my front yard from reclaimed bricks. It was the only way to get anything to grow in my rocky clay soil. The walls are three bricks high which is just high enough to keep my small dog from walking through my garden! .-= Condo Blues´s last blog ..Ditch the Disposables: Try Reusable Produce Bags =-. I just built one last weekend. I used leftover fence board. We shall see how it turns out. The plants are in there so hopefully they will grow and do well! 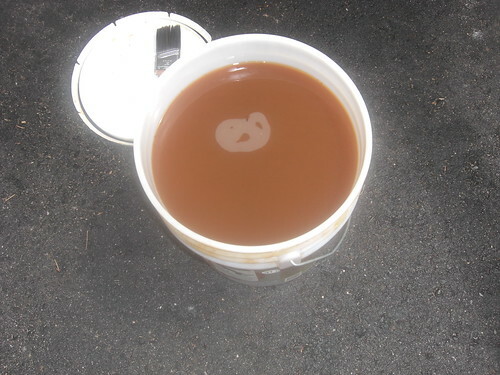 .-= Jen´s last blog ..Think the oil spill doesn’t affect you…… =-. I built mine last summer and its growing well. I thought you have some super incredible idea for the tool-handicapped but ok, buying them is good enough as well. I’ve convinced some wooden boxed crates out of my local warehouse which I still use today, but they are a tad bit smaller than yours. Hi,really very nice tools are provided by you regarding how to create a more impressive raised garden bed.I’ve also created a raised garden bed in my front yard and it looks very nice. Besides being a trend setter with these stylish raised beds, raised beds have plenty of advantages for even the novice gardener. Other than the external costs of time, effort and monetary needs to facilitate this facility; it improves drainage and warms soil faster in spring to provide for early harvest. Meanwhile, note that soil will be comparably loose as one would not usually walk on it. Really a great post regarding how to create raised garden bed. I’ll try to follow your suggestions. I’m looking forward to read more about it. Keep up such good work. thanks, i was planning on doing this as soon as the weather permits it. using left over fence boards, & had some ideas on the cornners, but your method is great. I think most people can realize how useful raised garden beds are, but then have decide between these ways to get them. Do you feel that it was worth doing it yourself since you wanted to many beds? 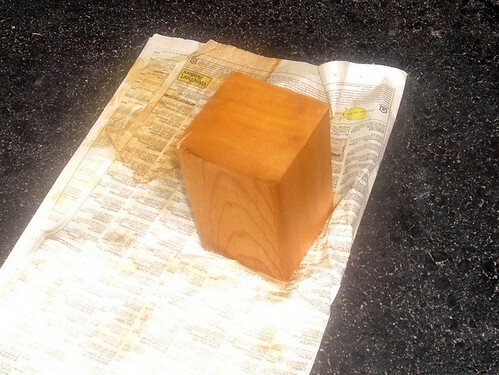 I like the natural, yet finished look your boards had after sealing them. I enjoy style whether it is clothes or gardening so may decide on buying one with a bit more to it.